Today we were rewarded with spectacular views of Everest, doctor Lhotse and Ama Dablam from the Everest View Hotel just above Namche Bazaar. I created a gallery of some of my favorites from today. On another topic, sick Garrett Madison was able to scout out the new route in the Khumbu Icefall and in fact is totally new compared to 2014. See Madison Mountaineering’s site for more and larger images. In a post on his site at this link, you can see it hugs the side towards Nuptse and should offer significantly improved protection from ice releases off Everest’s West Shoulder over the previous routes. However, it looks like there may be more ladders required to scale the high ice blocks towards the top of the Icefall. Not sure how all this will impact climb times. It is often said that high altitudes can damage the brain leading to damaged cells that cannot recover. Gorgeous photos – thank you for sharing and inspiring all of your supporters everywhere. The photo of the team with that background is remarkable – it is so clear that it looks “Photoshopped” – but we know better. God Speed Alan. 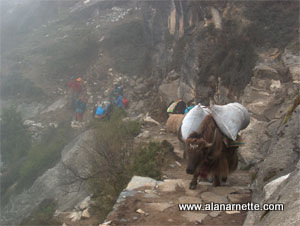 Thanks Carol, during the Everest season over 20,000 people a day view the site. I take this readership seriously and do my best to be accurate and responsible in my reporting. Also, I appreciate the opportunity to help my readers learn more about Alzheimer’s. From a non-climber – thank you for providing fascinating coverage & pictures. A member of our Rotary Club here in Canada was in EBC on a trek in 2011 and had the good fortune to meet you and speaks very highly of his brief conversation with you. I, like you, lost a parent to Alzheimer’s and have always had this worry in the back of my mind that the disease indeed has a hereditary link and that is a true concern. One helpful statement our doctor gave me after I had expressed the concern to him that my memory seemed to be fading (as I was always forgetting my car keys, glasses, cell phone, etc.). He said “So long as you know you have forgotten something, you’re OK. It’s when you don’t know you’ve forgotten something, that we will become concerned and take action”. That stuck with me. Thanks Alan for all the good work you do and the terrific reports & photos. Best wishes on Lhotse – be safe! just wondering do you consider Lhotse to be a bigger challenge than K2 or less? I’ll reserve my final opinion until I complete Lhotse, hopefully next month, but K2 is in a class of its own with steep terrain, no breaks, avalanches, rock fall and weather. What a view. Fantastic pictures. Thanks for sharing! Have a safe climb! Best photo of Ama Dablam I’ve ever seen! Thanks so much for these…they’re my new screen savers! Continued success on the trek! I think Namche may be one of the most photogenic villages. Great photos! Remind me of my previous EBC treks. Looking forward to your continuous updates. The link to the madisonmountaineering.com/dispatches isn’t working. Nice pictures – looks like upper flanks of Everest don’t have much snow. Jeff, if you copy the URL and paste it in your browser it will work, Good shots there. Thanks again for your work in keeping us informed on the Everest 2015 season. I wish you all the best with your attempt on Lhotse. Cian O’Brolchain’s (Everest 2012) Dad. As long as you up there safely Alan.